Even when it's cold and dark outside, enjoy the light, warmth, and scent associated with gardening. 1. Toss out any struggling houseplants and replace with healthy, lush ones. Better yet, add another houseplant to your collection. 2. Treat yourself to a pot of forced bulbs. Take them out of the plastic pot and repot in a pretty ceramic or other planter pot. 3. Create an indoor herb garden on your window sill. Or, as shown, plant several small herbs in a large dish. 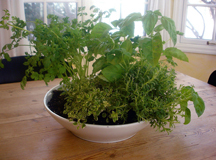 (Shown here, variegated thyme, basil, cilantro, and tarragon planted in a large white serving dish.) Snip off bits of fresh herbs directly onto your plate! 4. Create a bright centerpiece of primulas or mini-cyclamen in a basket or box, surrounded by sphagnum moss or other filler. 5 Take the time now to clean up and sharpen your tools. It may actually convince you that spring is around the corner. If you are an overachiever, paint any wood handles red to help you find them easily on the ground or in a flower bed. 6. Visit your local botanical center or even take a walk (on a milder day) at an aboretum. If nothing else, go to a greenhouse and just walk around. Sometimes simply the smell of things growing is enough to lift your mood. 7. Set up a grow light and start seeds indoors. The light and smell of something growing is wonderful! 8. Create either an elegant terrarium in a conservatory for yourself, or do one in a big jar with the kids. 9. In February through March, Iowans can force branches for beautiful indoor displays. 11. Get organized with a garden journal. Click here for the pages for our print-your-own The Iowa Gardener garden journal--lots of to do lists for each month and more!